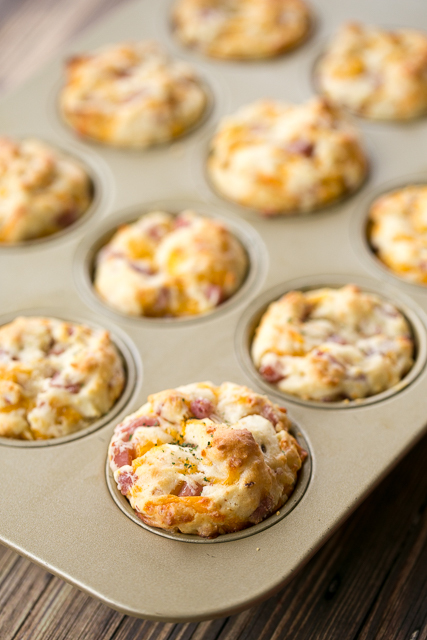 Muffin Cup Ham and Cheese Biscuits - SO GOOD! Great for breakfast, lunch or dinner. Make in a mini muffin pan for parties. There are never any left!! Flour, baking powder, salt, mayonnaise, ham and cheese. Ready in under 15 minutes! 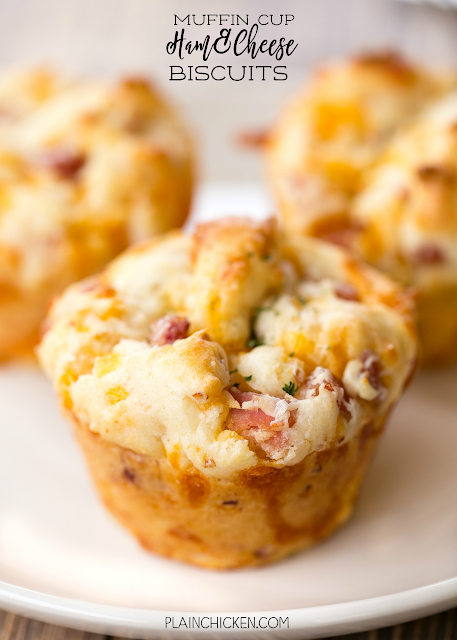 These Muffin Cup Ham and Cheese Biscuits are great for breakfast, lunch or dinner. They would also be great baked in a mini muffin pan and served at parties! They are stupid easy to make and they taste great!!! The secret ingredient in the biscuits is mayonnaise. Now, I hate mayonnaise. Hate it! I don't want to look at it much less eat it. I decided to put my mayonnaise phobia aside and give the biscuits a chance. O-M-G! Fantastic!!! The mayonnaise give the biscuits a cake-like texture and rich flavor. We both loved these Muffin Cup Ham and Cheese Biscuits. They will definitely be a staple in our house! Preheat oven to 425ºF. Lightly spray a regular or mini muffin pan with cooking spray. Combine all ingredients in a large mixing bowl. Stir until just combined. Scoop dough into prepared pans. Bake until golden brown, 15 to 18 minutes for regular muffins and 8 to 10 minutes for mini muffins. Do you use plain flour since you are adding baking powder and salt? If it were any other kind of flour besides all-purpose she would have specified that. They look super good and as a mayo fan, I know I would like them. There are no eggs in this recipe. Biscuits don't have eggs in their dough.